With Balboa Park Explorer, you can explore the rich cultural and artistic offerings of Balboa Park in an exclusive and affordable way. Rather than pay different admission rates at each museum, you can choose from our convenient Balboa Park Explorer Annual, One-Day or Multi-Day pass options, saving you time and money! General admission to all 16 Balboa Park museums. Complimentary admission to Maker Faire San Diego and the Cherry Blossom Festival. Get exclusive discounts on events, classes, shows, and more! Explorer Experiences – exclusive monthly special events taking you backstage and behind-the-scenes at your favorite museums, theaters, and gardens. Tailored newsletters keeping you up to date on the latest happenings in the Park. 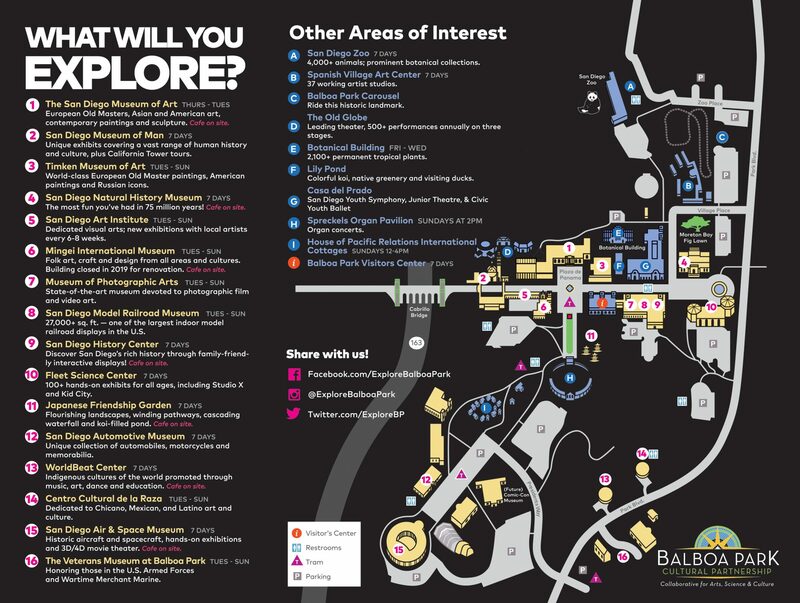 The affordable Balboa Park Explorer Pass lets you decide what you want to explore and when you want to explore it for 365 days, with no blackout dates. In addition to the Balboa Park Explorer Annual Pass being the best value, it also enables you to give back to the arts and sciences all year long, since every Balboa Park Explorer Annual Pass admission helps to fund the institutions you visit here in the Park! Your Balboa Park Explorer Annual Pass is valid from the date of purchase. When ordering online, select “Print At Home” to print your Temporary Seven-Day Explorer. The Temporary Explorer will allow access to all the venues while your permanent passes are processed. Your permanent passes will be mailed to the address provided within seven days. Your Balboa Park Explorer Annual Pass is valid for twelve (12) months from date of purchase. Please Note: Children under the age of three (3) do not require a ticket to enter any of the sixteen participating museums. General admission only. Named individual must present card. Photo ID required for adults. Not valid for certain events, special exhibitions, and programs. IMAX available at special price of $9.95. Non-transferable. Special exhibitions and film costs are determined by each individual museum. This pass entitles you to one admission to your choice of up to five (5) participating Balboa Park museums. Pass is valid for one day only, on the day of first use. One admission to each of the 16 participating Balboa Park museums. Pass is valid for seven (7) consecutive days, beginning with the day of first use. Pass does not provide re-entry privileges after first use at your selected location. Check with the museum for same-day re-entry information. One admission to each of the 16 participating Balboa Park museums. Pass is valid for seven (7) consecutive days, beginning with the day of first use. Also includes one day admission to the San Diego Zoo. Please Note: Children under the age of three (3) do not require a ticket to enter any of the sixteen participating museums. Not valid for events, special exhibitions, and programs. Special exhibitions and film costs are determined by each individual museum. Your Balboa Park Explorer One-Day and Multi-Day passes must be used within one year of purchase. When ordering online, select “Print At Home” to print your Balboa Park Explorer One-Day and Multi-Day passes. The printed passes will allow you access to any of the participating organizations. San Diego Zoo tickets must be used on the date of redemption. All sales are final; non-refundable and non-transferable. All passes have no blackout dates. Passes must be used within one (1) year of purchase date and are not valid for select events, special exhibitions, and programs. Before visiting a museum, please contact them or check the websites for information on hours, closures, additional events, special exhibitions, and film costs.